Missing In Pyeongchang: Whatever Happened To Judging Scandals? Call them the Missing Olympics. The Pyeongchang Winter Games are missing a few of the staples of previous Olympics. And that’s bad. And it’s also good. Let’s start with the good. In the decades I covered these events, the Winter Olympics weren’t the Winter Olympics unless everyone was frothing about the judging at figure skating. The 2002 Salt Lake City Olympics nearly had a conniption fit when the judges failed to award gold-medal marks to Canada’s Jamie Sale and David Pelletier in the pairs competition. The International Olympic Committee was besieged by stories of corruption in the judging, bias toward Russians Elena Berezhnaya and Anton Sikharulidze and calls to eliminate judged sports. The media roiled, the public complained and the suits fumbled for an answer. 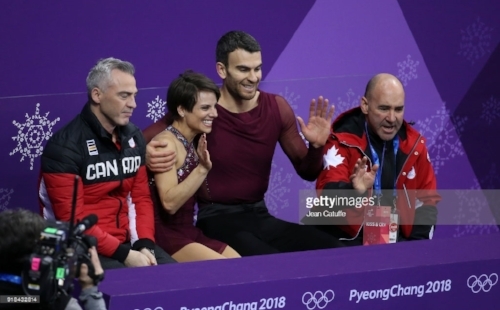 Eventually, the furore drove the International Figure Skating Union and the IOC to award a second gold medal to the Canadians—if only to prevent a riot. This was hardly the only such judging scandal. Going back to Toller Cranston’s artistry being snubbed by grim-faced figure carvers in 1968, figure-skating judging has been the bane of fair play. I will never get back the hours I spent reporting on the machinations of judging. But all that is missing in South Korea. There have been zero explosive charges of bias. Zero example of highway robbery from the Russian judge. Instead we have a running score total on our screen, talented analysts like Johnny Weir and Kurt Browning walking us through the nuances of edges and salchows. And everyone seems satisfied that justice has been done. To an old Olympic hand it’s shocking how little attention this good news getting. But then, bad news sells. Also missing at these Games are the best male hockey players in the world. As we know, the IOC and NHL failed to reach an agreement that would have benefitted both. The Olympics advertise the best athletes in the sport. And the NHL needs all the high-profile exposure of its product that it can get. We don’t have either in South Korea. It’s as if the IOC decided to stage the Spengler Cup instead of a tournament of the world’s best. Yes, the Russian/ Not Russian team has a few world-class players like Pavel Datsyuk and Ilya Kovalchuk. For all the TV efforts on back story of unlikely Olympians, however, the level of play is uninspired. When South Korea holds Canada to a 4-0 win, you’re not talking dynamic hockey. We made our suggestion for a compromise in I Don’t Like Mondays a year ago. It still makes sense for when the IOC sticks a Games halfway around the world in the heart of the NHL season. Stage the Olympic hockey tournament in North America in primetime wherein can garner huge ratings and exposure for the NHL and IOC. The IOC misread the history of Gary Bettman. The NHL commissioner loves playing the heavy. He takes it as a badge of leadership to shut down his product in labour disputes. Canning an Olympics was nothing to him if he could bring down the hammer. Now they know. Which brings us to something else missing in these Games. Sleep. Not for the athletes. For Olympic devotees back in North America. Hockey games are played at 3 A,M. ET. (Another of the reasons why the NHL said no thanks to the IOC). The figure skating final skates are stretching into the midnight hour in the Eastern Time Zone. Curling showdowns are likewise an exercise in insomnia. This was all known well in advance. But none of that matters when your alarm goes off in the middle of your REMs so you can see Canada play Russia/ Not Russia in hockey or see if Virtue/ Moir can win the dance gold medal. Speaking of Russia/ Not Russia, wasn’t Russia supposed to be MIA at the Pyeongchang Games? How are they here after years of news reports exposing the systematic Russian doping program allowed by the IOC when it gave a Winter Olympics to Vlad Putin in Sochi? To a dim reporter it might seem that “banning the Russian team”meant there wouldn’t be any athletes in South Korea. Apparently not. The place is thick with competitors at the Games under the banner of OAR— Olympic Athletes From Russia. You look up and see figure skating or hockey and the Russians seem as omnipresent as ever. The only downside for them seems to be they have to wear boring team uniforms and they don’t get the Russian national anthem played when they win a gold medal. Which brings us to another thing missing. No Russian has won a gold medal thus far at the Peongyang Games. Considering the doped Russians won consistently at Sochi four years ago (thirteen gold medals, four of which were stripped later due to doping), this shutout seems to speak eloquently to the imbalance produced by their nefarious scheming.